I finished my Here We Go Steelers! Socks on December 27 just in time to have them ready to wear for the final regular season game and the playoffs. Needles: Size 2 32" Knitpicks fixed circulars to knit sock and Size 10.5 Knitpicks Options to bind-off. Notes: Given that the Steelers have won the two games they've played since I knit these socks, I consider them to be a very successful knit. 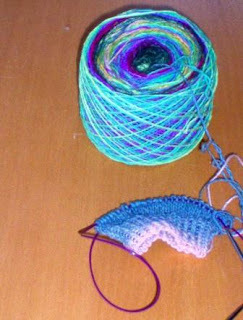 I cast-on this Sunday morning for my January socks with some Noro Kureyon Sock that I had in my stash.